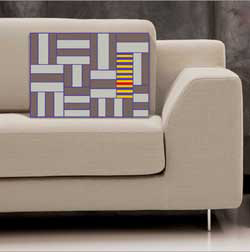 Dramatic abstract cushion designs inspired by the Bauhaus placed on a sleek contemporary sofa! They work so well together! And yet the Bauhaus influence started almost 100 years ago! Germany’s revolutionary Bauhaus School of Architecture and Decorative Arts (1919-1933) promoted simple, unadorned designs… thus ushering in the modern era of design. The teaching of abstract artists at the School greatly influenced the Bauhaus textile designs, which often featured geometric forms and vivid colour contrasts. The Bauhaus teachers placed a strong emphasis on colour, texture and tactility, which has had a marked impact on textile designs ever since. 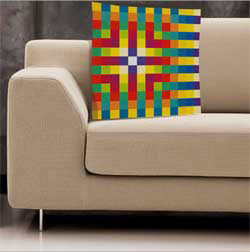 My ideal inspirational source for creating abstract needlepoint cushion designs for you! This strong energetic design,'SPIRAL', will make a bold statement in your contemporary home. And it’s not difficult to stitch! The striking spiral in primary colours is bordered by bold, dynamic geometric shapes. Pure Bauhaus! 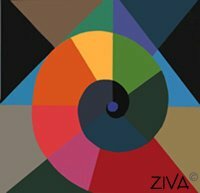 This basic geometric exercise of circles and rectangles fulfils the basic laws of colour and form, proportions, texture and rhythm. These are the essential elements for the foundation of art education…from the time of the Bauhaus School up to today! 'CIRCLES WITH RED'…what a perfect abstract design for today’s minimalist interiors! This geometric design, ‘COLOURS IN SPACE', is a perfect example of how colours that are side by side in the Colour Wheel can create a three dimensional effect! This basic design exercise creates a lively, dramatic impact! Also it’s an ideal design for a needlepoint beginner! Are you looking for a needlepoint design to try your first tapestry? This Bauhaus-inspired design ‘WEAVING’, with its simple geometric shapes, has a strong Cubist influence. An excellent project for a beginner! It was influenced by textile designs and weavings by Anni Albers …perhaps the best known textile artist of the 20th century. This strong graphic design that resembles a natural woven fabric in soft neutral colours is accented by horizontal stripes in primary colours. 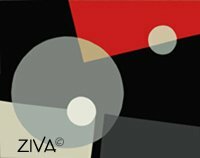 From these cushions designs from Bauhaus, go back to the main Cushion Designs page to see the great variety of designs offered from the ZIVA Collection.